Upgrade the look, feel, and quality of your home or business by allowing our team to install luxury vinyl flooring in Jackson, WY. By updating your outdated and dull carpets or laminate floors with gorgeous new luxury vinyl tile or plank flooring, you’re able to improve not only the look of your property, but also the real estate value. Visit our showroom to peruse a full selection of resilient flooring styles suitable for every room in your home. Whether you’re improving the function and appearance of your kitchen or replacing all the floors in your home with luxury vinyl plank flooring, we’re sure to have something to suit all your needs. Feel free to stop by and discuss your project with our knowledgeable design and sales professionals. We’ll help guide you to the perfect flooring style for your home. 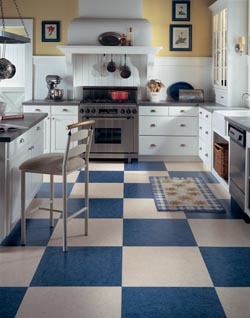 Vinyl has been a cost-effective and trusted flooring material for many decades. Modern manufacturing methods make luxury vinyl flooring even more versatile and stylish than ever. New 3D printing processes enable it to take on the appearance and texture of any natural or man-made materials including ceramic, hardwood, stone, or marble. Whether you prefer the elegance and sophistication of marble tile or the classic look of hardwood planks, there’s sure to be an option to suit your tastes. Do you love the look of natural stone tiles? Perhaps hardwood planks made of exotic species is your preference. No matter what your stylistic preferences, we offer luxury vinyl flooring styles to suit your needs. Visit our showroom to view samples of luxury vinyl tile with the appearance of marble or natural stone or select from a variety of luxury vinyl plank flooring styles in different species of hardwood or plank sizes. We’re here to help guide you to the best materials for your home or business. Once you’ve chosen your new flooring, be sure to schedule luxury vinyl flooring installation with our team of skilled professionals. We use the proper equipment and methods to remove your old flooring, prepare the subfloor, and install your new flooring so it’s sure to look and function well for many long years. Plus, we offer our Lifetime Installation Guarantee, which means we take care of any installation issues that might occur during the lifetime of your flooring. Contact us to schedule luxury vinyl flooring installation with our team. We’re proud to serve clients in Jackson, WY, as well as the surrounding areas.